The following is a guest post by Boliviana Cecilia Fencer of Spanglish-house. I still remember the time I watched the movie “Con Ganas de Triunfar” on the TV for the first time. “Stand and Deliver” has been, perhaps, one of the most watched movies in Bolivia. Not only for the successful story it tells, but also because the movie was based on the life of the Bolivian-born teacher Jaime Escalante. This amazing man left Bolivia, at the age of 33, looking for better opportunities in the United States. Education was his call. Hard work was his language. Determination was his message. Con ganas de triunfar. Quickly, he learned that his Bolivian Certification as a teacher was not valid in the States. He had to start from scratch. Working different odd jobs to maintain his family, while attending college to follow his call. He taught himself English and eventually he earned a college degree before he could be accredited as a teacher. It was in LA, 1974 when he started to work at Garfield High School. He taught Algebra first and later Calculus. The school was not one of the most re-knowned schools in the area. It was located in a rundown neighborhood of Los Angeles, where violence and drugs were common. However, he did not bend to the circumstances, instead he transformed. He incorporated ganas in the classes he taught. Eventually teaching his students to think mathematically, to dream greater dreams for their future and to work hard to achieve those dreams. In 1978, he started to teach Calculus, he wanted to raise the bar for his students, give them a bigger challenge and let them realize that they also were college material. His first group had five students. Only two of them passed the AP (Advanced Placement) Calculus test. The next year, seven out of nine students passed the test. In 1981, 14 out of 15 students passed the test. He taught his students the discipline of hard work. But his success did not come overnight. It took many hours a day of math, weekends, and summer vacations. He showed all those students how to discover their real potential. To find success not just in the test, but in every assignment they had. In 1982, 18 of his students took the Advanced Placement Calculus test and all of them passed. However, 14 of them were accused of cheating by the test maker. Escalante believed it had to do with racism. He readily agreed to let the students retake this AP college level exam. Twelve retook it and all of them passed. 1990 – Award for Greatest Public Service Benefiting the Disadvantaged, an award given out annually by Jefferson Awards. 1999 – Inductee National Teachers Hall of Fame. 2002 – Member, President's Advisory Commission on Educational Excellence for Hispanic Americans. 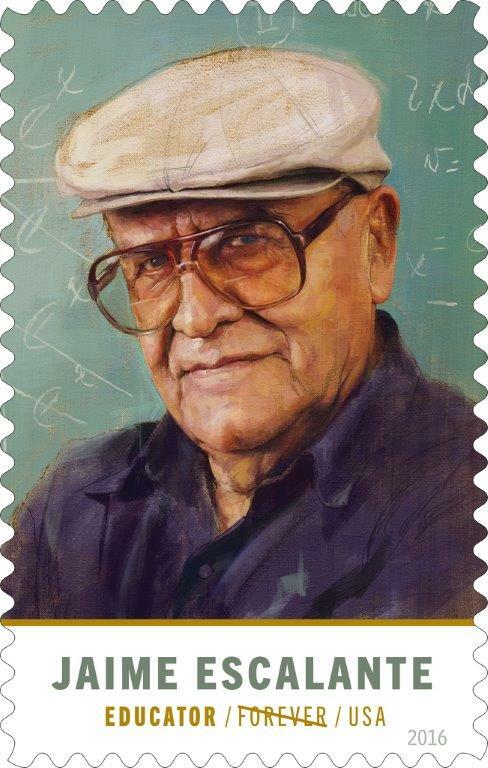 This past July, 2016, the United States Postal Service issued a First Class Forever "Jaime Escalante" stamp to honor "the East Los Angeles teacher whose inspirational methods led supposedly 'unteachable' high school students to master calculus." Cecilia Fencer, is a Latino Wife, mommy and maestra. She's also a homeschooler, interpreter and writer, and spends her life raising her family and helping the Latino community of Rockbridge County, Virginia. She blogs at Spanglish-house.